NEW ORLEANS, Louisiana, June 21, 2010 (ENS) – In the largest citizen enforcement action ever taken under the Clean Water Act, the Center for Biological Diversity is suing BP and Transocean Ltd., for illegally spilling more than 100 million gallons of oil and other pollutants into the Gulf of Mexico. The suit was filed Friday in U.S. District Court for the Eastern District of Louisiana. The Center is seeking the maximum possible penalty against BP for the spill that began April 20 when the oil rig Deepwater Horizon, owned by Transocean and leased by BP, exploded and caught fire off the coast of Louisiana about 50 miles southeast of the Mississippi Delta, killing 11 men. The rig burned for 36 hours before it sank, leaving the damaged wellhead spilling oil and gas into the water at the latest flow rate estimate of 35,000 to 60,000 barrels per day, released last week by the National Incident Command’s Flow Rate Task Force. While, BP is now containing approximately 28,000 barrels of oil per day, the remainder continues to gush into the gulf. “It is undisputed that responsibility for the oil spill rests primarily on BP and that efforts to stop the leak have failed. The oil and toxic pollutants flowing into the Gulf of Mexico are a plain violation of the Clean Water Act,” the Center claims in its complaint, which states that BP does not have a permit to discharge the oil. Investigations to determine the causes of the incident are ongoing in Congress and at several federal agencies. In addition, President Barack Obama has established a Presidential Commission to get to the bottom of the situation. If BP’s violations are found to have been the result of gross negligence or willful misconduct, the maximum fine is $4,300 per barrel spilled. At this rate, the company is already liable for approximately $11 billion in Clean Water Act penalties. 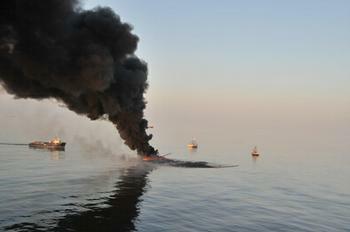 If the spill continues through August 1, 2010, BP’s liability will be approximately $19 billion. The penalties will be paid to the U.S. Treasury and will be available for Gulf coast restoration efforts. Under an agreement between BP officials and President Obama reached last week, the company has set aside $20 billion in an independently administered escrow fund to cover spill-related claims. “I would hope we will pay claims within 30 to 60 days,” Feinberg said. The Center’s lawsuit seeks a full accounting from BP of how much oil is gushing into the Gulf of Mexico each day and what pollutants are mixed in with the oil. “The government has yet to take any criminal or civil actions against BP,” said Kieran Suckling, executive director of the Center for Biological Diversity. The Center has taken other legal actions in connection with the BP oil disaster. On May 27, the Center filed a lawsuit against Interior Secretary Ken Salazar and the Minerals Management Service to strike down the agency’s exemption of 49 Gulf of Mexico drilling projects from all environmental review. That suit was filed in the Fifth Circuit Court of Appeals in New Orleans. On June 3, the Center filed an official notice of its intent to sue the Environmental Protection Agency for authorizing the use of toxic dispersants without ensuring that these chemicals would not harm endangered species and their habitats. The letter of notice requests that the agency, along with the U.S. Coast Guard, immediately study the effects of dispersants on species such as sea turtles, sperm whales, piping plovers, and corals and incorporate this knowledge into oil-spill response efforts. A federal judge has ruled that there is no reason to delay an oil spill lawsuit against BP Plc while the U.S. Judicial Panel on Multidistrict Litigation decides whether or not to consolidate the more than 130 lawsuits arising from the Deepwater Horizon rig explosion. On May 27 Chief Judge William Steele of the U.S. District Court for the Southern District of Alabama denied BP’s motion to stay the litigation Tuesday, ruling that preliminary motions might proceed. BP says it has now spent roughly $2 billion since April 20 trying to stop the oil spill and to pay initial claims for damages. The spill has now fouled shores in four states – Louisiana, Alabama, Mississippi and Florida. Today, the National Oceanic and Atmospheric Administration, NOAA, expanded the closed fishing area in the Gulf of Mexico to include areas where the oil slick is moving beyond the current boundaries off of the Florida panhandle and due south of Mississippi. The closed area now covers 86,985 square miles, which is about 36 percent of Gulf of Mexico federal waters. This federal closure does not apply to any state waters. Closing fishing in the designated areas is a precautionary measure to ensure that seafood from the Gulf will remain safe for consumers.